QUITO, Ecuador—Actress Angelina Jolie visited Ecuador over the weekend in her first such trip as special envoy for the U.N. refugee agency. Jolie has visited various countries over the past decade as a goodwill ambassador for the U.N. High Commissioner for Refugees. The agency said in a statement Monday that it was her first trip as special envoy since her appointment earlier this month. The agency said Jolie was on her third trip to Ecuador to assess the situation of thousands of refugees who have fled violence in neighboring Colombia. She previously visited the country in 2002 and 2010. 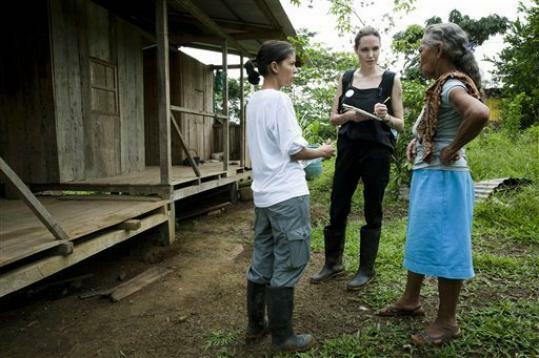 During a two-day visit, Jolie met with impoverished Colombian refugees in northern Sucumbios province and talked with Foreign Minister Ricardo Patino. "I really encourage the government to continue their tradition of assistance to vulnerable families in need," Jolie said, according to the U.N. agency's statement. There are currently about 56,000 Colombian refugees living in Ecuador, plus thousands of others who are seeking asylum.